Ark is the name of the fifth of six arks with which the Nazra leave the earth. It's conceived as a temporary habitat and simulates the astronomical and meteorological conditions of the earth and Ancyria. At the time of departure, there're 6,000 Nazra and 1,300 selected people on the ark. Its aim is to find a new homeworld for the Nazra. The journey of the Ark to its target planet Nazra'ni takes almost 2'200 years and doesn't run without problems. Worth mentioning are an asteroid impact, which causes a climate change for around 100 years, and social upheavals of the people, so that the Nazra withdraw from the world. After arriving on Nazra'ni, they leave the ship and send it out again tofind a new home for the people or, if necessary, to return to earth. The Ark is hexagonal shaped and covers an area of approximately 98,000 km2 (Diameter: approx. 350 km). 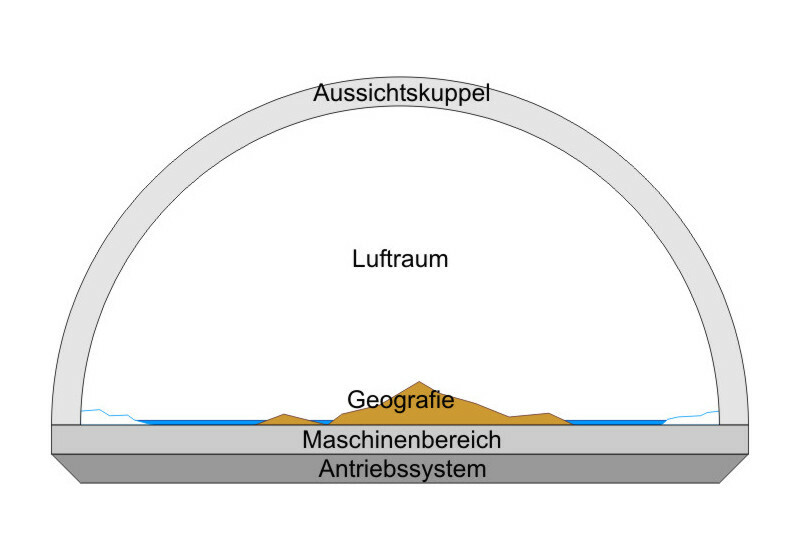 For comparison: This corresponds to about a quarter of the area of Germany. The upper half is closed by a transparent dome, where the star seemingly slide along during the journey. The lower part is equipped with administrative devices (generator, drive machines, control system, etc.). Every Ark is charged with crystal energy in Ancyria, but has to refill the tanks regularly during their journey. For this reason, the course of each ark runs through a series of solar systems. In doing so, the system independently takes account of the energy consumption and selects its routes along promising solar system, where it tries to refuel Yeris radiation. Correspondingly there's an energy pensum for the inhabitants, which was divided according to defined guidelines among the population. 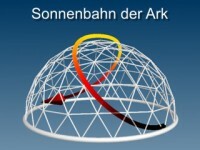 The Ark has an omnipresent computer system that accepts and implements commands in a specific language, the syntax. This allows access to a large number of prefabricated mechanisms, which are referred to as magic in the population. Some effects are so complex and elaborate, that even Nazra can't do it on their own. The board system also offers the advantage that the required energy is referred from the ship reactors. The starry sky always moves from the center to the outside according to the travel speed. In other words, new stars appear in the middle, which move towards the edge and finally disappear below the horizon. Stars that are far behind the target, appear as omnipresent fixed stars. There's a projected sun that crosses the sky along a double curve in a rythm of 24-hours. The sun's orbit remains the same thoughout the year. The magnetic northern pole of the Ark is located in the center (bald mountains), the southern pole at the outer edge (ice ring). The destination (usually a brightly shining sun) always lingers exactly at the zenith and gains in size when approaching. During the last few days of the approach, the light level is kept at a normal level by darkening the dome. As a result, the stars become darker at night, until the Ark has corrected its course and set a new target. In 1824 d.A. an asteroid hits the dome of the Ark and damages the climate control. At this time, the resident Nazra already reside on an island and decide not to interfere with the problem, since the Ark is equipped with an emergency program for such cases. However, the emergency program fails. Over the next 80 years, the climate is changing incessantly in some areas, causing radical changes in the economy. Deserts are suddenly inhabitable, while temperate zones are sheltered by snowstorms - wars, poverty and famine are the consequences. Finally, the Nazra realise that there's need for action. For this, a human called Leon Carter is brought from the earth by the Nazra in order to restore the controls. Despite a misunderstanding, Carter takes care of the task and is able to fix the problem in 1924 d.A. In consequence, the Nazra regulate the climate and maintain the current state to avoid further conflicts among the people. Originally, the Ark was conceived as complete world for the Nazra to bridge the travel time. Due to the influence of the people, however, the system had to be revised several times during the journey – mainly due to excessive energy consumption by syntax operators, but also because of technical limitations. When the Nazra visit the Ark in 2,400 d.A. once again, to set up the magic system and to stabilize the land masses, some areas of the Ark are stored in instances. Instances aren't replicated, but calculated and simulated exclusively in the memory of the Ark. Therefore the change of an instance can only take place by means of the syntax or magic. Furthermore, the six continents are divided into autonomous storage areas with their own control mechanisms, so that problems on a continent no longer affect the others. The oceans remain the only connecting plane, which as flexible buffer allows a smooth transition between the continents (for example, when gravitation is significantly increased on a continent, one gradually feels heavier at approach). As the trust between Nazra and people breaks, the Nazra leave Ancyria and thus also the earth. To this end, they're building six space arks, which approach for different destinations in order to find new homeworlds for their passengers. An'tar-de'ya – "First in the goal"
In'antra-tar – "Luminous Cloud Town"
Only on the Ark, also a few people are evacuated, which works well for several generations, but then generates problems again. As the Ark reaches its goal, the planet Nazra'ni, the era of rebuilding begins. The remaining people then travel on (without knowing) with the Ark to find a new home – thus the Syntaxera begins for them.